There's just something fascinating about films that deal with gambling. Usually you never know what's going to happen, but I always expect the person to lose, thus providing the audience with the message that gambling is bad. California Split puts a nice spin on gambling films, mixing together comedy, drama and action. I stumbled across this movie on crackle.com, which I later found out was the original theatrical version (the DVD has a few minutes cut due to music copyright issues). California Split stars George Segal as Bill Denny, a magazine writer who likes to gamble. He meets Charlie Waters (Elliott Gould), a gambling addict and the two get on quite well. Pretty soon Bill is skipping work and staying out late gambling with Charlie as his life starts falling apart around him. The two decide to put all their money together for a high stakes poker game, which Bill plans to be his final game. Being the gambling film fan that I am, California Split is a dream come true. This movie has horse racing, poker tournaments, roulette, craps and any other type of gambling sport you can think of, but there's more to the film. Much more. Robert Altman crafts a very realistic and funny portrayal of how desperate gamblers can be. Segal and Gould are amazing as the two protagonists and the supporting cast (featuring Jeff Goldblum and Ann Prentiss) help the film too. My favorite scenes are those filmed in the Tijuana casino, which display a fantastic 70's country theme. 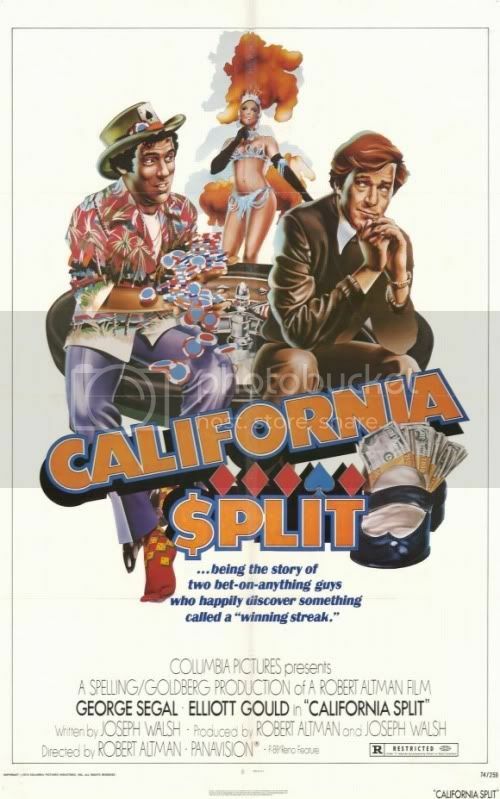 Of all the gambling films I have seen, California Split just may be the best...or at least its probably my favorite. Take your love of cinema to the next level with a degree in television and video production at Guide to Career Education.